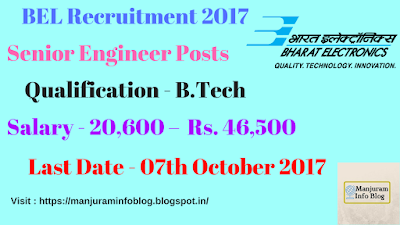 BEL Recruitment 2017: Bharat Electronics Limited(BEL) invites applications for the recruitment of Senior Engineer in the discipline of Electronics,Computer Science & Mechanical.The last date for online applications for BEL Jobs is 07th October, 2017. Candidate must have B.E. / B.Tech / B.Sc Engineering / AMIE from AICTE approved College/Institute or a recognised University in Electronics,Computer Science & Mechanical. How to Apply for Bharat Electronics Limited Recruitment 2017: Eligible candidates apply may submit their application in the prescribed format along with the copies of the relevant documents in support of eligibility and the Application fee payment receipt/Challan with the Journal Number, in a sealed cover super scribing “Application for the post of Sr. Engineer (Civil) / Sr. Engineer (Comp.Sc) / Sr. Engineer (Mechanical)” and addressed to Manager (HR&A), Bharat Electronics Limited, Sahibabad Industrial Area,Ghaziabad - 201010 by post/courier. The last date for receipt of completed application : 07th October 2017 . Note:One copy of payment receipt may be retained by the candidate for future reference.